Justin finishes two games in a week, isn’t episodic gaming glorious, well, at least lately? Ethan covers new takes on familiar Lovecraft and Resident Evil territory. Aaron better catch them all before they overtake Los Santos. Plus the creepiest QTE’s. 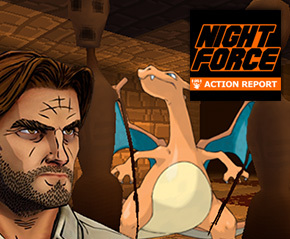 Night Force Action Report – The editorial video game podcast where the HorribleNight.com cast gets caught up on the games they’ve been playing, new releases, brainstorms original material for the site, and pitches a few game ideas. This show was recorded live on Twitch.tv/HorribleNight. The final video will be available on YouTube.com/HorribleNightTV.